The Tata Building India School Essay Competition is one of the key initiatives undertaken by the Tata group of companies to motivate the youth of India towards thinking about nation building. The essay competition provides a unique platform to encourage young leaders of tomorrow to showcase their expressions in writing, on a host of subjects related to nation building. Started in 2006 with 6 cities and 1 lakh students in English language, the competition has grown manifold to become India's largest essay competition touching almost 2 million students across 8 languages in 2010-11. The current year program is set to yet again touch 2-2.5 million students in 5000+ schools nationwide. The idea of the competition has been very well received by both the students and the teaching fraternity reflected by the overwhelming response from participating schools and students. It is the belief of the Tata group of companies that the young minds of the country, if directed positively, can bring greater recognition and glory to the nation. In the first year in 2006, over 1 lakh students from 240 English medium schools participated in the essay writing competition covering the cities of Delhi, Mumbai, Kolkata, Chennai, Bangalore and Hyderabad. Buoyed by the tremendous response received from the schools in the first year, the Tata group of companies extended the activity in Hindi amongst key Hindi medium schools across 8 cities in Northern / Central India and later in West Bengal with Bengali medium schools. This was followed by the launches of separate editions in Gujarati, Marathi and Tamil languages progressively. 2008-09: The competition took a quantum leap in the year 2008-09 as it moved from 12 to in 24 cities across the nation covering more than 800 schools and around 6 lakh students. 2009-10: The 4th edition of the competition covered 36 cities where almost a million students across 1500 English medium schools participated. The theme of the competition was 'Future India'. 4 regional felicitation events were conducted in Oct- Nov 2010 where the city winners were felicitated. The national level winners were felicitated by Dr. E. Sreedharan-the Metro Man of India, at Delhi on 12th October 2011: The winners got a chance to travel on Delhi Metro trains and visit the metro museum, also got a once in a life time opportunity to see and admire the Rashtrapati Bhavan as a special guided tour was arranged for them. 2010-11: The 5th edition of this competition in the English language was launched in September, 2010. Nearly 1 million students participated across 40+ cities and about 1800 schools. The city level winners were felicitated in October-December 2011. The national level winners for 2010-11 have been identified and will be felicitated in Delhi. The theme for 2010-11 was “Poverty Reduction”. In the academic year 2010-11, the English edition expanded its coverage to 40+ cities. The Hindi language version spread its wings to 27 cities and two new language versions, Kannada and Oriya were launched. Overall, nearly 2 million students took part in 8 language editions across nearly 150 city level competitions. 2011-2012: In the year 2011-2012, the essay contest was held in 8 languages covering 5000 schools & 150 cities. The theme was 'Clean and Green Nation' and the city winners of the competition were felicitated across the country. 2012-2013: In the current year 2012-2013, the essay competition is scheduled to be held in 10 languages with Telugu & Malayalam as new languages across 170 cities, 6000 schools and will cover approximately 2+ million students. The theme of 2012-13 is 'Science & Technology for India'. The current year program is set to yet again touch 2-2.5 million students in 6000+ schools nationwide. Also as a new initiative Tata Building India Online essay competition is open for students participating on Individual basis. *Topic for the Essay Competition is provided on the spot. Having covered 7.5 million students through previous six editions, India’s largest school essay in the 7th edition of this happy India Initiative will also offer special one-time Tata Building India scholarships to select needy students in each city. The essay competition is a two-phase activity across all the participating schools in the country for students of classes 6-12. The first phase consists of exposing these young minds to inspirational Tata-linked films which stimulate them to think about the nation. Following this, students are asked few questions based on the films shown. To ensure a level playing field, the students are divided into 2 participating categories across all languages (Junior - class 6-8 and Senior - class 9-12). Speak for Earth - Which is about some of the initiatives that Tata companies have taken to preserve and nurture, nature and habitat. Followed by this the topic of the essay is shared with the students and they are requested to write an essay on a given topic of national significance. The underlying theme of the topic is always nation building. The topics are carefully chosen for students to be creative, insightful and genuine. The theme of the 2012-13 competition is “Science & Technology for India”. What should India do to win 20 gold medals in 2016 Olympics? If I were the Prime Minister of India what would I do to make India a super power by 2020? What should we do to make our education system prepare us for a better tomorrow? What would you do to make India a happy country? What we can do as a country and citizens to reduce poverty and ensure basic amenities for every Indian? The essays of the school level winners across the schools from each city are collected and evaluated by a panel of 3 judges from the academic and the journalism fields, two winners in each category are shortlisted for city level recognition as winners from the respective cities. The city level winner’s essays in both categories from each city are finally judged by an elite panel comprising of eminent people to choose the national winners. It would be of interest to note that the essay is written by the child only once and is evaluated at three levels. In the past, the national jury included judges like the Padmashri Awardees from the field of Literature, Art, Culture, Sports and Vice Chancellors of reputed universities, Editors of prominent newspapers, Writers, Heads of departments of English from Mumbai and Chennai universities and eminent personalities in journalism, etc. The winners are rewarded at each level, the school level winners are amplified at school and special functions are held to felicitate city level winners at regional level. The national level winners are felicitated in Delhi. Prizes at the school level include certificates, medals and special Tata Building India merchandise. The city winners and the runners-up receive gifts like Digicam / Handycam / MP3 player, Certificates and trophies. The national level winners receive laptops as the grand prize. The crowning moment for the national winners and the runners-up is the expected visit to the Rashtrapati Bhavan and a face-to-face meeting with a national dignitary like the President of India / Vice President of India. Shri Mohammad Hamid Ansari, Vice President of India words during his interaction with Tata Building India School Essay Competition National Winners 2009 at Rashtrapati Bhavan in New Delhi, ‘Being happy is a basic human need. Youth today have many more opportunities but also much more responsibility. Habits to live by law, being respectful to others' dignity, and integrity to self are important. A Happy Society is one in which you accommodate each other so that it can move forward. 'Marching together' is inclusive growth, with synchronizing of individual efforts"
Mumbai: The Tata group today felicitated the 73 national winners of the 10th edition of Tata Building India School Essay Competition 2015-16 at a ceremony held in New Delhi. This edition of the competition encouraged young minds to express their thoughts on ‘Digital Technology for a Better India’. The 2015-16 edition of the competition was held in 12 languages across 230 cities with participation from nearly 3.3 Million students from 7,800 schools. Harish Bhat, brand custodian, Tata Sons, was the chief guest at the event. Speaking at the occasion, Mr Bhat said, “To all the students who have gathered today, the only message that I would like to give you is as you move forward in life, remember you should pursue excellence and not be satisfied with second best in what-ever you do. God has given us so many capabilities, it is our duty to develop these capabilities to the level of excellence we can achieve and finally use this excellence for the benefit of our community and nation as there is nothing greater than achieving that in one’s life”. Tata Building India School Essay Competition is India’s largest national school essay competition that has provided a platform for students from classes 6 to12 to express their views and ideas on nation building and pertinent issues. With each passing year, Tata Building India School Essay Competition identifies an inspiring and challenging theme for the competition on topics of national relevance. 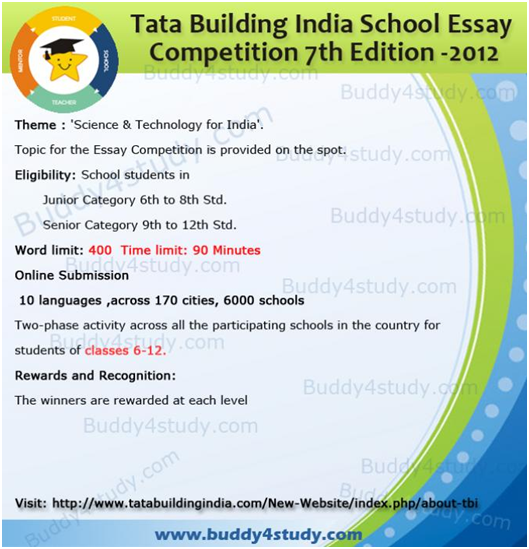 Tata Building India School Essay Competition is a two-phase activity in participating schools. In the second phase, the topic of the essay is shared with the students, on which they are required to pen an essay, based on the year’s theme, announced earlier. School level: Essays at the school level are evaluated by judges within each school. Winning entries from each school qualify for city level evaluation. City level: The essays of school level winners in each city are evaluated by a panel of judges from the field of academics and journalism, among others. The best essays win city-level recognition. National level: The best essays from each city are finally judged by an elite panel comprising of eminent people to choose the national winners in each language (regional level winners in case of regional languages). For more information, please log on to www.tatabuildingindia.com. One can participate in exciting online contests on https://www.facebook.com/TataBuildingIndia.